An Orthodox reader of this blog has asked me about the “problem” of tradition, as it pertains to the queer question. How do I reconcile my contention that homosexual unions may be ethical and holy, with the Tradition and traditions of the Church, seemingly so hostile? This “problematization” of tradition arises in other contexts, too: in plans for reunion with the Oriental (Monophysitic) Orthodox churches, stalled over the thorny problem that their saints are our heretics, and our saints their heretics; likewise in dialogue with the Roman church, which recognizes, and is not about to stop recognizing, a full fourteen additional post-Schism councils, as ecumenical in status. What, then, is to be done? One approach has been for the “conservative” and “liberal” parties in the Church to throw caution to the winds, and to assert themselves in despite both of each other and of whatever elements within the Tradition (in the broadest sense) which might challenge them. That seems to be pretty much what is now going on in the Anglican Communion; and the best conciliating efforts of Rowan Williams as archbishop of Canterbury aside, the Communion’s dissolution is to be expected. At one extreme, the Anglican bishop of Karamoja in Uganda supports the death penalty bill for homosexuals. At the other, the dean of the Anglican seminary in Cambridge, Mass., calls abortion a “blessing” and an “holy work.” Violence proliferates. Never mind that the Gospel says not one word about gay marriage: many ordinarily faithful people are, almost without discussion, to be treated in the same way as would heretics and unbelievers. And yet, Christ calls us “friends” (Jo. xv. 15). And “by this shall all men know that you are my disciples, if you have love one for another” (Jo. xiii. 35). One of the most politically resonant icons in the Church’s iconography is that of SS. 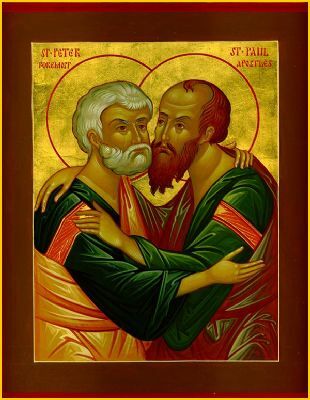 Peter and Paul embracing. They may have disagreed about important doctrinal questions, as the apostles and fathers generally have disagreed: “And some coming down from Judea, taught the brethren: That except you be circumcised after the manner of Moses, you cannot be saved. And when Paul and Barnabas had no small contest with them, they determined that Paul and Barnabas, and certain others of the other side, should go up to the apostles and priests to Jerusalem about this question” (Act. xv. 1-2). Therefore the apostles are depicted as friends. If we (Orthodox and Roman Catholics) are to avoid some of the snares into which the Anglican Communion has fallen, we must take care to imitate Peter and Paul, preserving our unity where the dogmas of the Church are concerned, but permitting a legitimate diversity of theological opinion elsewhere. We must take care to remember that we are friends. This essay will constitute the first part of a series, “Disagreement Between Friends,” proposing some initial ideas for how to manage the problematization of tradition and, no less important, how to continue living in catholic love and reconciliation. [Ross] is not a homophobe as I can personally attest. But if he cannot offer something for this part of our society except a sad lament that they are forever uniquely excluded, by their nature, from being a “microcosm of civilization” [and thus from participating in the institution of marriage], then this is not a serious contribution to the question at hand. It is merely a restatement of abstract dogma…. Dogma correctly understood is not abstract and dead, but historical and living. Just as a philosopher might proceed by asking what must be true of the mind such that we are able to interpret the realities we experience, in the same way a theologian proceeds by asking what must be true of God (dogmatically speaking) such that we are able to interpret our experience of eternal salvation. Granted that, I cannot conceive how homosexual love or unions do any injury to dogmatic theology; nor can I conceive why the queer community need be suspicious of dogmatic theology. This is a justification of dogma, at once as deeply conservative as the early African church in which the likes of Tertullian could flourish, which can at the same time be embraced by the queer community, and likewise by any persecuted or marginalized group suffering at the hands of Pharisees and Caesars. I have written about Orthodox seminarian Eric Iliff here, but the names and stories are without end. The martyrial witness of the Church’s queers does not threaten the Church’s dogmatic system; it helps, like all martyrial witness, to support and explain it. Politics, Law, Morality: Essays by V.S. Soloviev, trans. Vladimir Wozniuk (New Haven: Yale University Press, 2000), pp. 108-09. Jaroslav Pelikan, The Emergence of the Catholic Tradition (100-600) (Chicago: The University of Chicago Press, 1971), p. 1.